Platanias is one of the most well known villages in the region of the western Crete, only 10 kilometres from the city of Chania. It is a beautiful holiday resort where you can find a lot of quality hotels, great swimming facilities, pleasant bars or clubs and above all the most attractive 4 kilometres long sandy beach. Across Platanias there is a small isle that is a protected area and where the famous wild ibexes "KRI - KRI" live on. After spending your time on the beach you can have the most pleasant walk through the alleys of the old village up on the hill. There you can taste the wonderful Cretan cuisine and our strong traditional drink "raki" or "tsikoudia" while enjoying a breathtaking view. 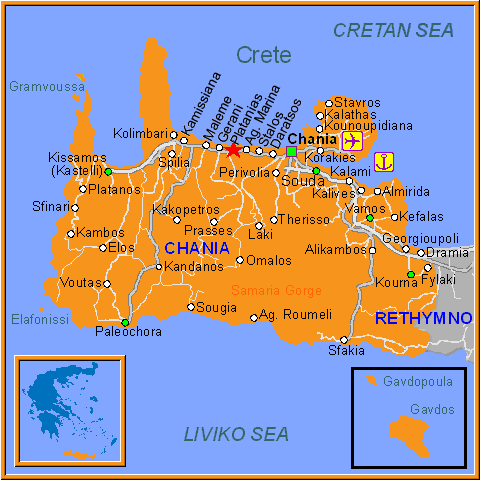 Platanias is also known in the region of Chania because of the excellent night life it offers. Here you will discover the best bars and night clubs of Chania and have a wonderful time until dawn. Platanias is really a blessed place where you will discover the true Greek hospitality and have the time of your life. Online Travel guide with the best accommodation in Platanias. Find the cheapest hotels is Platanias & get exclusive online deals. Great rooms at bargain prices. Book online now! Compare Hotel Prices and read Reviews from others. Great Hotel rates and information See photos, reviews & what's nearby Platanias . Detailed tourist and travel information about hotels of Platanias providing also regional information.